Aquarius is the pioneer of using e-beam to test original fluids and liquid samples. 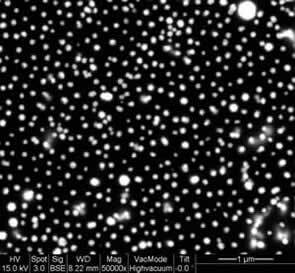 Aquarius can test and monitor coating materials in their original form, especially the liquid state. The functions of the chip and liquid sample holder are versatile (disposable version for slurry testing, inline version for process monitoring, quick assembly version for electrode testing) and high-resolution inspection simultaneously. 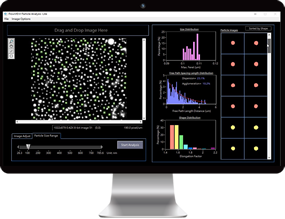 The system is capable of displaying the images of sample in its liquid state under original conditions and providing analysis results such as particle size distribution, dispersity, uniformity, concentration, shape and composition required for R&D and production. 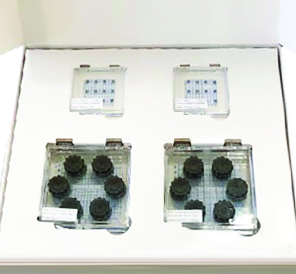 The liquid sample holder in the MFC system is compatible with different preparation tools (such as powder disperser for powder size distribution analysis, centrifuge for bio-sample morphology observation and membrane filter for liquid defect identification) for static inspection in various applications. The sample in the holder can be transferred to different inspection platforms to obtain the correlative information and make versatile and in-depth analysis of the sample possible. 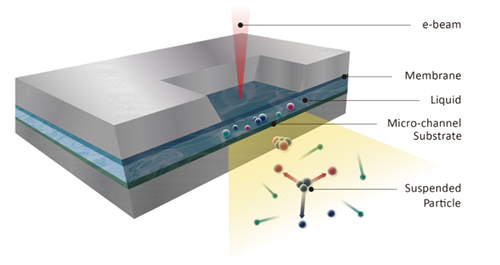 Produced using the semi-conductor manufacturing process together with surface treatment, the membrane can be made hydrophobic, hydrophilic or bifunctional linkers for different applications, allowing samples under test to automatically adhere to the observation window for best image resolution. To ensure image quality, the membrane thickness is designed to be less than 30 nm, yet it is made robust by adjusting the window size and shape to withstand the pressure difference between the vacuum and atmosphere. Combing with microfluidics and high-precision pogo pin with leak-free sealing design, the liquid sample holder is capable of controlling and monitoring the micro-environment. 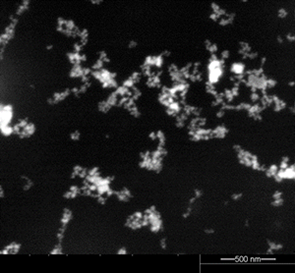 The microfluidics designs were optimized by Computational Fluid Dynamics (CFD) simulations to achieve the best transportation model for the samples. The liquid sample holder has special mechanical design to boost the operation efficiency and can finish the sample loading within a minute. The electrical charging/discharging can also be transmitted to the control system and inside the microfluidics via pogo pin design. Additionally, the heat exchange fluid can be circulated in one of the flow channels, thereby accomplishing the functions of temperature control and fluid properties monitoring, allowing nano-scale in-situ testing of the samples under their original activity. 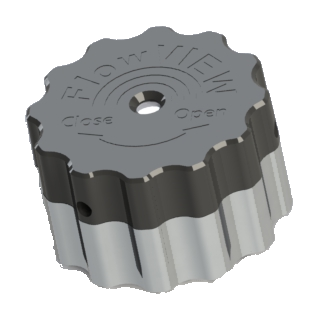 This software is included with the FlowVIEW Starter Kit. Simple - The software interface has user-friendly design and it's easy to get started. Simple - The liquid sample holder has special mechanical design to boost the operation efficiency and can finish the sample loading within 0.5 minute. 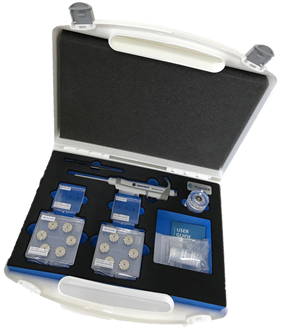 After purchasing a starter kit, subsequent materials can be ordered in supplementary packs which include both micro-channel substrates and microscopic fluid chips.